If you are looking for Bowed Psaltery music, Donna does a great job of arranging music for this instrument. Enjoy this wonderful gathering of fifty (50) bowed psaltery players performing the classical song. The Toasting Song from The Student Prince. 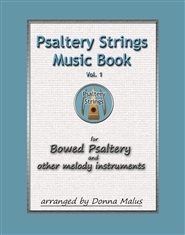 This song was arranged by Donna Malus for the bowed psaltery. BBC Radio has a great Virtual Session where the sheet music is displayed and music plays along in the background. If you like to play with an accompaniment or learn by hearing a song played, this is a great site to visit. When you click to open the Virtual Session, you see a book-style menu. Just click on what you want to see and hear! Sample of music arranged specifically for the bowed psaltery. 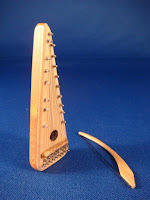 Donna Malus of psalterystrings.com has become an expert at arranging music for the bowed psaltery. She shares her talent with us. 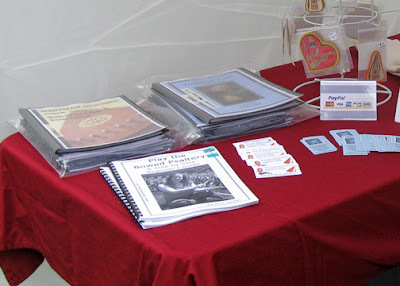 At the forum for bowed psaltery players, Donna has a discussion section called Sheet Music of the Month. Her latest song arrangement is Waltzing Matilda. I can’t wait to try that one out! She’s also arranged songs like Ode to Joy and Childgrove. Childgrove is an English folk tune. Once you’ve heard it, it will become a favorite. What is so good about these song arrangements is that in addition to being made especially for the bowed psaltery, lots of extras are provided. And with the inexpensive starter instrument sold here, you have no excuse not to play! Duet with National Mt. Dulcimer Champion Joe Collins in the background using his great CD “Looking Ahead”. Joe gave his permission for me to use a few of his songs for this purpose. Thank you Joe! I absolutely LOVE this CD! I’m playing a tenor bowed psaltery tuned chromatically to the key of D (C# and F#s are moved to the right side and Cs and Fs were moved to the left. This way all notes can be played on the right side! finished so far, but thought I’d share photos of this one. 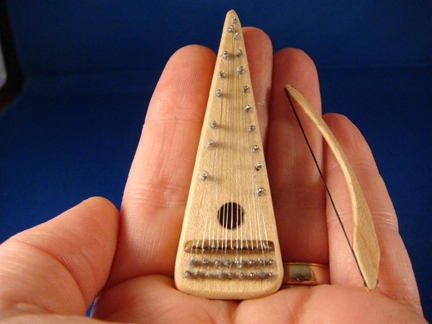 The psaltery is 2-5/8″. The bow is 2″ The pins are cut from the tiniest nails I could find – 1/4″ after cutting. Only 1/8″ of each pin sticks up above the wood. Really hard stringing this thing. The bow strings are 14/0 black fly tying thread – super fine and 8 strands. I plan on turning some of these into tac backed pins with the pinch type backs like tie tacks. Also plan on turning a few into pendant necklaces. Some will just be miniatures. 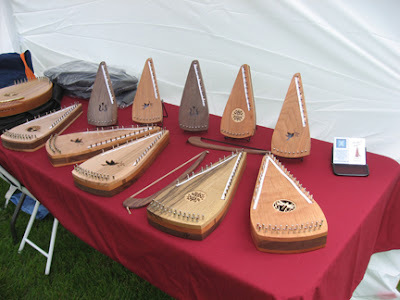 Cost will be $50 a set (psaltery + bow) plus $3 shipping (anywhere in the world) if anyone is interested and that is a bargain. It took a full 7 hours to string one, not including a half day for adding pins, and many more hours to make the body of the psaltery and bow and add 5 coats of lacquer to the wood (plus sanding). I tried adding rosin to the bow to see if I could hear any sound, but didn’t. Could just be too high for me to hear. Thanks to Terry for sharing these. 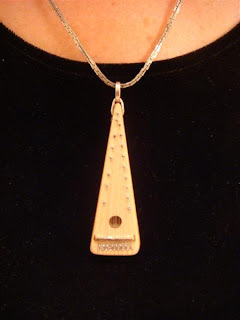 A lovely version of Moon River played on the bowed psaltery. 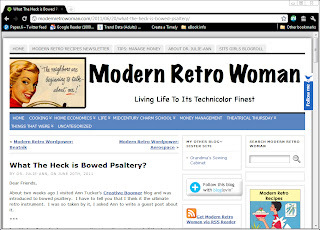 I was asked to write a guest post for Modern Retro Woman about the bowed psaltery. It was a lot of fun to introduce her readers to this instrument. Watch this video: Celebrating the 4th of July with a bowed psaltery. Although they had their history wrong on the bowed psaltery, it still sounded like it belonged in this setting. A friend and I had a booth at the Morris folk music festival. It was a great weekend of music and we introduced a lot of folks to the bowed psaltery who had never heard of it before. After seeing for themselves how easy this instrument is to play, many bought instruments and books. 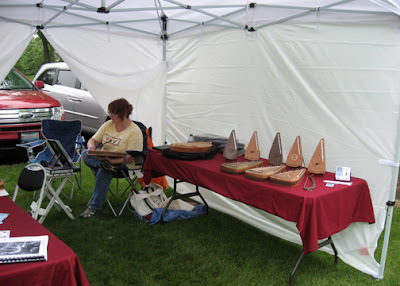 Today my friend, Donna from PsatleryStrings, had a booth at a Dulcimer Folk Music Festival about an hour drive from us. She had never had a vendor booth before and asked if I’d help her “man” the booth. Donna had small and large bowed psalteries made by another friend, Tish Westman. We had the instruments on one table. We had patches, t-shirts and books on the other table. Donna let me put my new book (the paper copy) out on the table. There it is in the front corner of the table. So cool to have it out where people can see it and browse through it! I had the greatest time! I became the resident teacher in the booth. As people came through the booth and asked “What’s that?”, I would put one in their hands and show them how to play the first line to Amazing Grace. For people who had never played an instrument (dragged along spouses) and those who had only recently picked up an instrument, they were pleasantly surprised to be able to pick up a tune so quickly. I even taught a few young kids and the look of accomplishment on their faces was priceless! Being in face-to-face retail like that was new and out of our comfort zone for both of us. In a booth like that, not only is your product on display but you are also. Playing the instrument to entice people to stop in and look. Answering questions. Showing people how to play the bowed psaltery. It felt very much like being on a stage all day. It was fun but exhausting. We were pretty good at it! 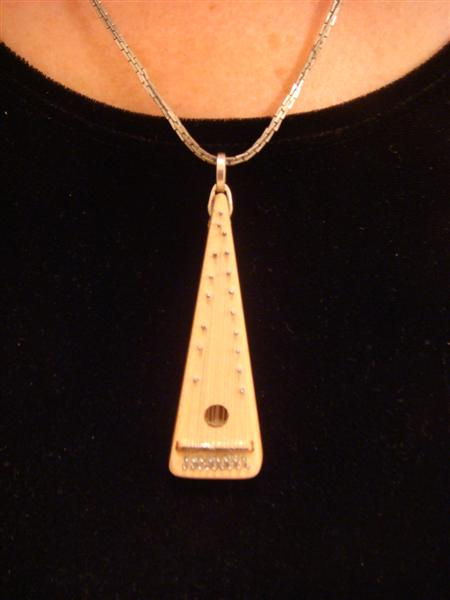 The Bowed Psaltery is an instrument ANYONE can play.